Nyala is every bit as sweet, intelligent and graceful as she is beautiful! Tanner and Laura Beth are two people dear to my heart. I've known Tanner for years--my husband coaches for Tanner's father at Norcross High School, so I've known Tanner since I started dating my husband in 2004. It seems like just yesterday that Tanner was in middle school, and running the ball out to the referees at the Norcross High games. A few years passed, and Tanner was a junior sitting in my British Literature class. He was always fun-loving, full of smiles, and polite. He was as a teenager, and still is, the epitome of a gentleman. He played football for Norcross in high school, and I went from watching him run the ball out as a child to playing on the team. Now, he coaches at Norcross with his dad, brother and my husband. I first met Laura Beth at a Christmas party when she was helping with the children. Her mother was my daughter's pre-school teacher. Natalie, my daughter, would tell me when Miss Laura Beth would visit her class, and she was excited when she got to play with Laura Beth at the party. Laura Beth is the epitome of a southern lady--just like her mother. She is always extremely sweet and polite, and has a smile that will light up a room. Tanner and Laura Beth's story began when they were only children. They are only a few weeks apart in age, and were raised in the same church. They grew up together, went to school together, and have known one another essentially their entire lives. When Tanner called me to ask if I would take pictures of their proposal, I was thrilled. He arranged everything, and I met his friend (and another former student) Hamp, at Chateau Elan while Tanner and Laura Beth were eating lunch. We went to Tanner's truck, found the box of rose petals, and arranged them in a row of the vineyards. Hamp went to go meet them inside while I hung out and waited. 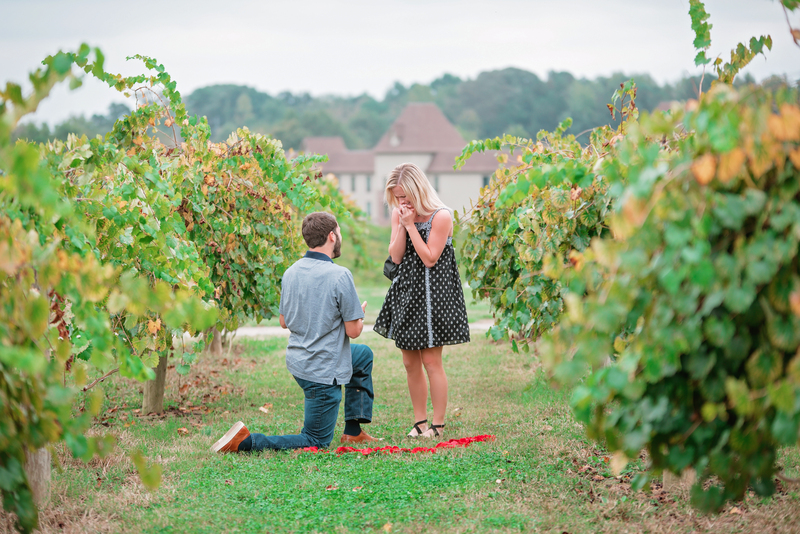 A few minutes later, I got the heads up text from Hamp, and pretty soon they were rounding the corner of the vineyard. 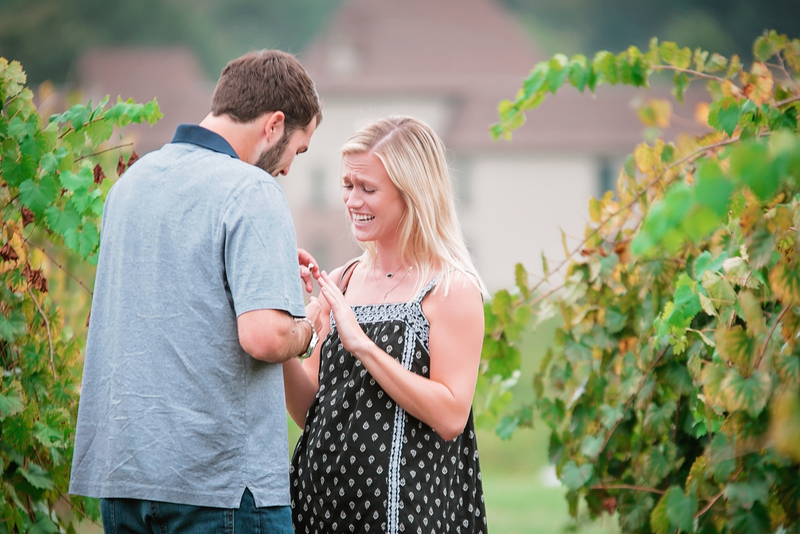 It took Laura Beth a minute to realize what was happening, and then she was in disbelief as Tanner got down on one knee to propose. After the initial shock, the first thing she said (I told you she was a perfect southern lady!) was "Did you ask my parents?" In a world where tradition seems to have gone by the wayside, it was refreshing to hear her say that. Of course, Tanner did--(these two were raised right ya'll!) and there were lots of hugs and tears that followed. I have been blessed to be a part of quite a few special memories as I've gravitated toward being a full-time wedding photographer, but I have to say this particular memory I was able to capture will always be one of my all-time favorites. These two sweet, southern souls have come full circle from childhood friends to soon-to-be husband and wife, and I couldn't be more excited for them! Congratulations Tanner and Laura Beth! May God bless your engagement, marriage, and lives together--thank you for allowing me the privilege of capturing this special moment for you! When Stephanie told me the story of how she and Joe met, I had to laugh. 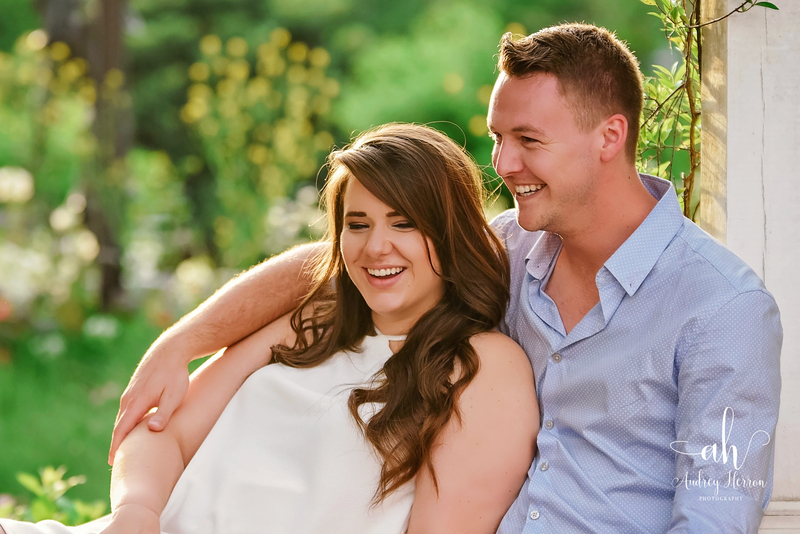 We were about halfway through their engagement shoot at McDaniel Farm Park, and I was enjoying listening to their stories and watching them interact with one another. I had no problem picturing what Stephanie described: after spending the evening trying to catch Joe's eye, she finally walked right up to him and let him know that she had been attempting to get his attention all evening. Although Stephanie and Joe live in Cincinnati, they wanted their engagement pictures here in Atlanta since this is the town where they met. Both went to business school at Emory, and we went back and forth about a good location that would reflect their personality and the town where they met. When I first met them in the parking lot, Stephanie promptly informed me that they were not very photogenic. Five minutes into the shoot and she and Joe were all smiles. They were genuinely a fun couple to be around, and their chemistry was evident as they walked, laughed, and flirted during their session. I hardly gave any direction--they made my job easy--I just had to follow them around and capture their natural interaction with one another! We got some amazing pictures, and they will be fun memories for them to look back on one day. In June, Stephanie and Joe will marry in New York. I wish them the very best as they begin this next chapter in their lives. May your marriage be filled with blessings and laughter! I am grateful I was able to capture some sweet memories for you! It was an absolute honor for me to get to photograph my brother's wedding. Sure, growing up we didn't like each other most of the time...we fought and drove our parents nuts...you know--the typical "She's looking at me....he's on my side...."etc...but as most siblings do, we eventually grew out of that phase. I think one of my favorite years was when we were in high school together--I was senior, and the drum major for the band--Bryan was a freshman and a drummer. Know what that meant? That I got to tell him what to do--and he actually had to do it! (That's not why it was my favorite year...okay, maybe a little...) but I woke him up every morning and drove him to school. I drove us home from band practice every day. I'm pretty sure he missed me (a little) when I went away to college at Newberry. We had fun times...once, when we were home alone because our mom was having surgery, and Dad was staying with her at the hospital, he even blew up the grill when we attempted to cook dinner for ourselves...and it jumped a foot off the deck and singed his eyebrows. One year, not too long after I was married, my husband was away for Valentine's Day. Bryan was single. He called and asked what I was doing, and followed it with "This stinks let's go out." And my brother took me out to dinner on Valentine's Day. He's cut trees for me in the yard, and cut my grass a few times when my husband was swamped with football season. He makes me laugh every time I talk to him, and I love him more than he probably knows. I also have to say that Bryan is one of the hardest working guys I know. He started working at Top Turf in Lawrenceville, Georgia when he was 15 years old. When he graduated from Loganville High School, he went to work with the landscaping crew for the county, and to this day, he still is working both jobs. It's at the Top Turf job that he met his bride, Kristin. They've known each other for years, but their paths never exactly connected at the right time. Kristin worked in marketing in North Carolina, and then eventually came back to work at her dad's company where she reconnected with Bryan. I remember the first time I met Kristin--I was doing some fall photos of my daughters and my niece, Bryan's little girl. Kristin came to the park and she was incredibly laid back and sweet. She seemed very genuine, and we chatted as I finished up pictures. I offered to take one of her with Bryan. Kristin was just dressed in some comfortable work out clothes--she hadn't come prepared for a picture--but she shrugged and said "Sure!" It struck me that most girls who were super self-conscious wouldn't be caught dead in a photo with yoga pants and no make-up, and but her response reflected Kristin--she is who she is and she's comfortable and confident in her own skin. I liked that. Bryan and Kristin share a love for running--they often train and run races, including the Peachtree Road Race every year. They are casual and fun to be around, and Bryan can have you laughing in minutes. My brother went through some challenges and difficult times--and those challenges helped shape him and make him who he is today. He just kept walking forward, and in walking he crossed paths with Kristin. I'm grateful he found someone who he can run with, bike with, and work out with. I'm grateful he found someone who he can cook with, (because he's a master on the grill ya'll!) laugh with, and joke with. I'm grateful he found someone who makes him happy...and makes him smile. He doesn't know this, but when I was up front ready to shoot the ceremony, I watched him for several minutes. His head was bowed, his eyes were closed, his hands neatly folded in front of him as he waited for his bride. I know what was going through his head because I know my brother...and I know he was reflecting on all that has passed and brought him to this point in his life. Watching him made me tear up...but they were happy tears...because I know he's finally found someone special to share his life with, and I couldn't have been prouder as I watched his smile (through the camera lens) when his best man tapped him and told him to look up and see his beautiful bride. Kristin, thank you for making my brother happier than I think I've ever seen him. I'm thrilled to have a sister (I always wanted one...and probably would have eagerly traded Bryan for one when I was a little girl) but I'm thrilled things worked out as they have. Welcome to our crazy, loving family--and may God bless your marriage and your beautiful life together. I love you both! In July of 2013, Kristen accompanied Leslie, the owner of Jacob's Ladder Therapeutic Riding program to check out a little roan pony. There was nothing spectacular about him that day--he tried out well, but the next day Kristen just couldn't get him out of her head. After agreeing that he was a good fit for the program, the decision was made to bring Roanin to live at Jacob's Ladder. After a few weeks, it was evident he was a different horse than Kristen and Leslie had previously observed. He became shy and difficult to catch. There was just something about the pony that tugged at Kristen's heartstrings, and she volunteered to work with him. She would stand for sometimes an hour in the south Georgia heat just waiting to lead him in. She faced challenges with Roanin that forced her to grow as a horsewoman and learn about natural horsemanship. Kristen learned Roanin could not be rushed. He could read a person and their energy before they even got close to him. After a brief trial and appearance in the program, it was decided Roanin was not a good fit and his temperament just wasn't a good match for children. Knowing the bond they had developed, Leslie offered him to Kristen. She had dreamed of owning her own horse since she was a little girl, and he finally came home to live with her in the spring of 2016. "God brought him to me at a unique time in my life. It was three months before I left my ex-husband. Roanin helped me find who I was again. He showed me love and together we learned how to trust someone again. God used him to help me see who I was in the Father's eyes. He gave me a safe place to run when part of my life was in shambles. When we are connected, we speak a language that exists without words. He helped me find my confidence and self-worth." As Kristen's best friend, I can attest to God's use of this horse to help her through one of the darkest times of her life. I knew how special they were to one another. After lots of prayers, Roanin began to improve. It gave her a reason to hope. Her prayers were being answered. I was prepared to receive a phone call from her, and make a four hour trip to Valdosta just to take some special photos of them together. One day she called--but it was to tell me he had improved. 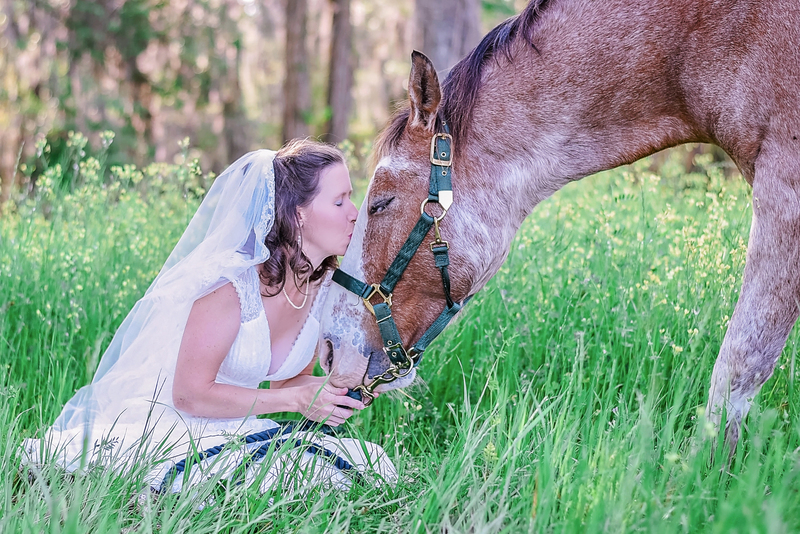 Instead of a somber drive, I made an excited drive--a trip to capture her bridal portraits and include this special little horse who had defied all odds. This picture says it all--you can tell how much they love one another, and it was my favorite from the shoot. Today, Roanin is healthy and is even able to be lightly ridden! Kristen said one of her favorite things about the bridal portrait shoot was watching Roanin interact with me. I was pretty surprised after knowing his history that he walked right up to me to check out my camera. He stood still while I stroked his nose and scratched him behind the ear--and he even nuzzled my hands looking for a treat. It was an all-around special trip, and he is a special horse! Kristen may have rescued Roanin and given him unconditional love and a forever home--but I know he rescued her in a time that she needed unconditional love, and for that, I'll always be grateful to him. In 2004, I was in my first year of teaching at a small middle school in Monroe, Georgia. I couldn't have asked for a better group of kids to teach--particularly a sweet, red-headed girl who was all smiles and probably had the highest average in my class consistently throughout the year! If someone had told me then one day she'd be teaching my daughter horseback riding lessons and I would be photographing her wedding, I would have never believed it! It was pretty obvious Elizabeth would be someone special--she danced, had the lead in the school play, was captain of the cheer-leading squad and rode horses...so it was inevitable that she ended up with a special guy! Both Luke and Elizabeth were born in Jackson Tennessee--but they didn't meet until years later when Luke saw a picture of Elizabeth (provided by her older sister Madeline) and knew he had to meet her. He invited her to a bonfire in Jackson when Elizabeth was visiting family for the Christmas holidays, and that was the first of many dates! Even though they were entering into a long-distance relationship, they did so agreeing to see where God would lead them! That's the pretty awesome thing about this couple--it's evident that God has been the center of their relationship from the beginning, and He worked through them separately as they discovered their purpose before bringing them together when Luke proposed on June 23, 2016. Luke has been an amazing support for Elizabeth--from assisting with horses on the set of Sleepy Hollow (and even acting as as a stunt double and character from time to time) to sending her roses (I was there for a lesson for my daughter when they arrived one Valentine's Day!) to building the arbor in the sweeping pasture where they exchanged their vows. 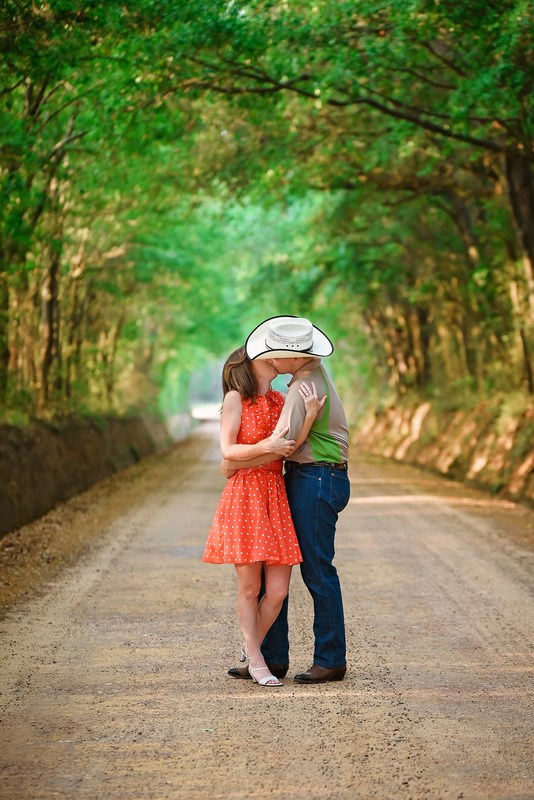 I was blessed to be a part of their special relationship in capturing their engagement photos as well as their wedding day--and both times Luke was the epitome of a southern gentleman! He always answered me with "Yes, Ma'am", helped hold my equipment, and even helped me scramble over a pasture fence the day of their wedding for some shots! 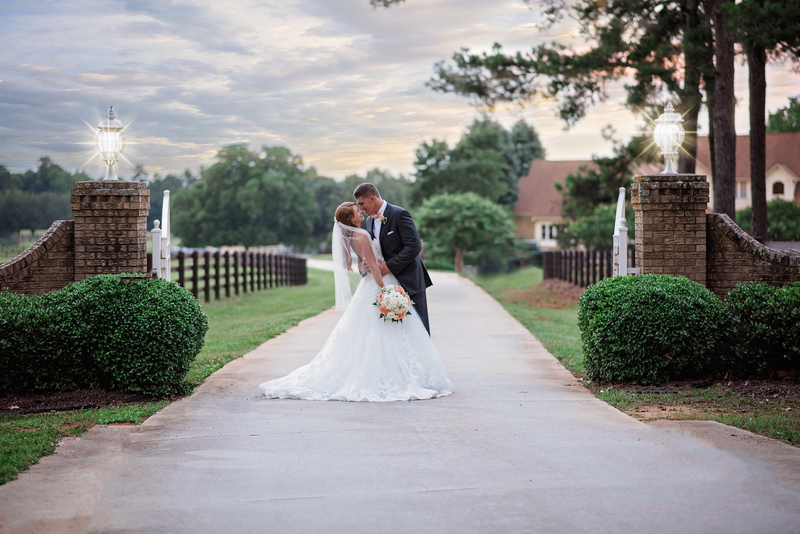 June 17, 2017 was a beautiful day--Mr. and Mrs. Dabney worked tirelessly to ready their scenic farm for Elizabeth and Luke's wedding, and their efforts didn't disappoint! The long tables on the back lawn were draped with white table cloths, blue glass vases and pink roses. Romantic outdoor lights were strung across the tables. I had a wonderful time photographing Elizabeth's wedding day, and one of my favorite moments was walking in front of Elizabeth and her father as they rode out to the pasture where the ceremony would take place. 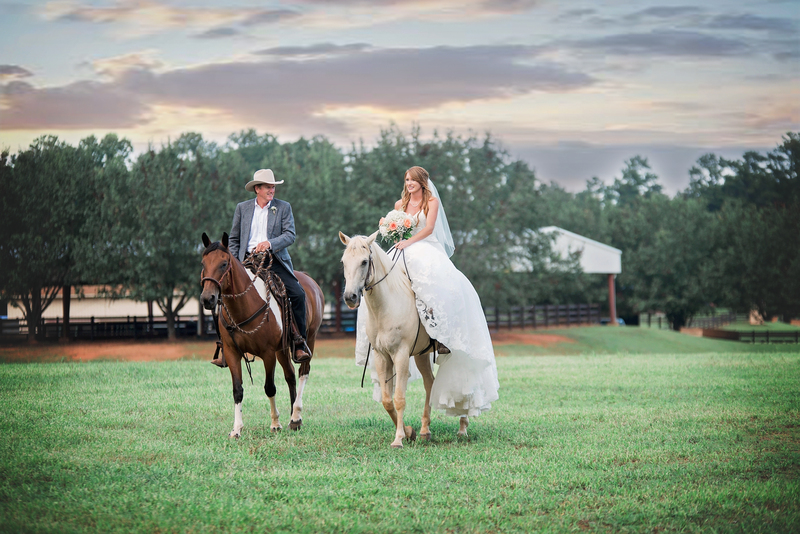 I ran ahead once we got close, and shot some pictures of them cresting the hill--Mr. Dabney looking handsome in his jacket and cowboy hat and Elizabeth looking every bit the stunning fairy-tale bride with her gorgeous gown and riding her white horse, Accolade. I don't think there was a dry eye as those gathered to witness Luke and Elizabeth exchange vows watched that scene--and I know it's a moment I'll never forget. After a touching ceremony where Luke and Elizabeth pieced together a cross and exchanged vows, they sealed their promises with a kiss--Luke even dipped Elizabeth--so romantic!! They celebrated with dancing and dinner on the patio, and cut probably the most gorgeous wedding cake I've ever seen! The cake was made by Elizabeth's aunt and was STUNNING! They ended their special day with a sparkler send off and a lantern. Their beautiful day was every bit as special, classy, and elegant as they are, and I was truly blessed to be a part of it! Congratulations to an amazing couple--may God bless your marriage and always be in the center of it! Elizabeth's wedding took place at Dabney Farm in Mansfield, Georiga--Dabney Farm is available to rent as a wedding venue! Check them out! Anne of Green Gables is dear to my heart. Growing up, and still today, reading those stories, or watching the classic series on TV, could transport me back in time to Prince Edward Island, the Lake of Shining Waters, or the White Way of Delight. Anne often referred to Diana as a "kindred spirit", and as a busy mom, I can count on one hand the "kindred spirits" I have in my life. After heading to South Georgia to shoot my best friend's wedding, I think I have found another kindred spirit. Meet Debbie of Daffodil Acres--a multi-talented farm girl who can haul a heavy load of hay, can just about anything she grows of her farm, take beautiful pictures and write imaginative children's books about the animals who live on Daffodil Acres. I got the opportunity to visit her beautiful farm and meet some of her animals! She raises sheep, chickens, ducks, geese, guineas, has horses and a steer. I have to admit--I'm a little obsessed with farm life (thanks to Little House on the Prairie and Joanna Gaines) so I was over the moon to hang out at Daffodil Acres. Debbie fixed me fresh guinea eggs for breakfast (amazing) and we traded some photography tips and took a few pictures of the animals on her farm. She emailed me a copy of her manuscript, Amelia Lambheart, to read to my five-year-old daughter. Ya'll--this book is so cute, and I was able to meet the star of the story! (In fact, she was quite interested in my camera!) The story details a lamb who wants to fly (given the name Amelia Lambheart because of the brown circles around her eyes that resemble goggles) and subsequently gathers discarded feathers from chickens and ducks in an attempt to fashion a set of wings. Now this English-teacher turned photographer was super impressed with Debbie's talents! I'm encouraging her to blog more about her farm life and maybe share some fun how-to's or recipes--so if you'd like to follow her farm, look it up on Facebook or Instagram (Daffodil Acres). You'll find some blog posts, some great photos taken by Debbie of her animals, and fun stories about them....and maybe, in the near future, a published children's author! When Stephanie contacted me about shooting her wedding, and I found out it was June 3, I was surprised! June 3 is my wedding anniversary. Of course, as the wife of a high school football coach, you rarely get to celebrate your anniversary (or birthday, or many other holidays) on the exact day, so it actually worked out that I would be able to photograph her wedding. Needless to say, this couple will forever be etched in my memory! When I first met Stephanie, I learned that she and her fiance were planning a wedding in only a few weeks--(and I thought I was rushed when I had eight months!) I've been pretty impressed with the way she's handled everything with such an easygoing attitude. I've been very blessed to have wonderful brides to work with, and Stephanie definitely fits into that category! 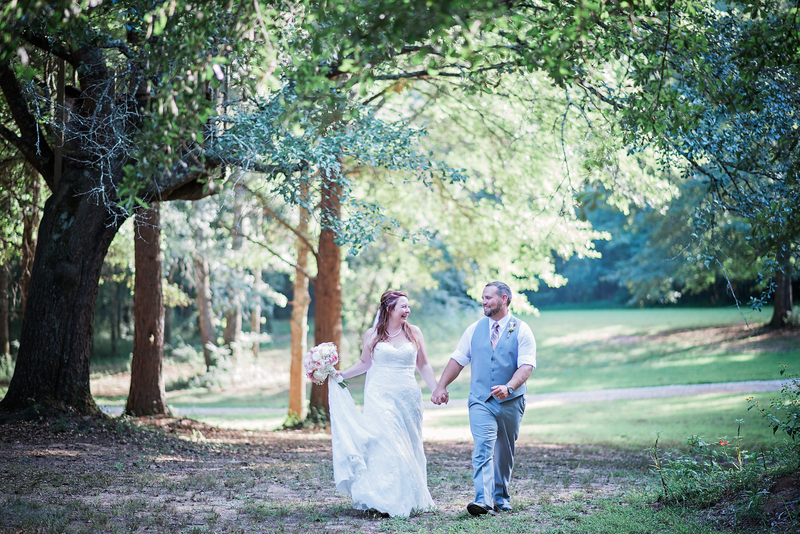 She and her fiance Michael met while attending UGA, and they plan to marry at the historic home where they first met. (Can I say how excited I am to be shooting at a home built in 1904...we are talking gorgeous front porch, stone pillars, tons of character, and a massive magnolia tree in the front yard that screams To Kill a Mockingbird with it's gnarled roots and knot holes.) For her engagement shoot, we met at the Athens Botanical Gardens, and in-between swatting mosquitoes (thank goodness my second shooter Kristal brought bug spray....I'm talking I was getting tagged through my leggings!) we captured some gorgeous images! It was pretty evident that Michael and Stephanie were crazy about one another. Their images are filled with genuine smiles and playful laughter, and I couldn't be more excited to be a part of their special day! 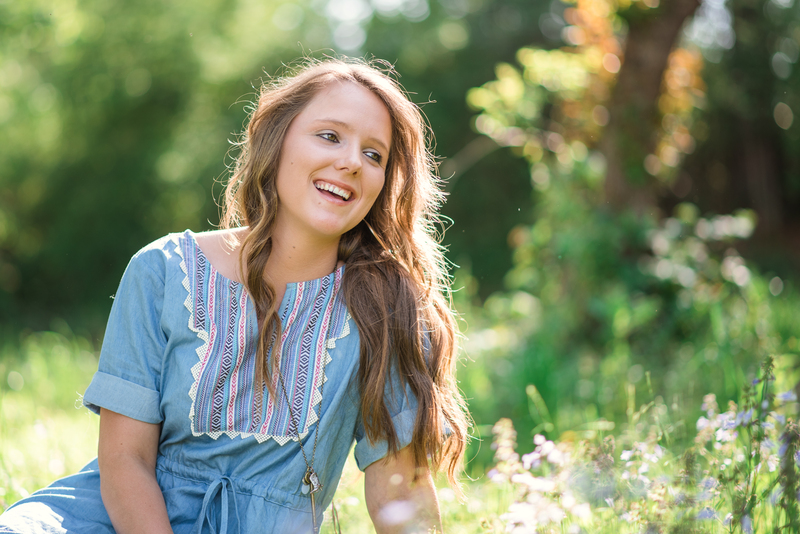 I thought it was only fitting to write my first official blog about one of my oldest friends--someone who has seen me through a journey with many twists, turns, and unexpected roads. I didn't plan to be a photographer. In fact, that career never even entered my mind as a possibility when I was planning for college. I was extremely involved in music throughout high school, and my "plan" was to be a high school band director. I was awarded a full scholarship on flute to Newberry College in South Carolina, where my high school band director went to school. I was from a small town, and moving out of state was a bit intimidating. I didn't know anyone--and when I found out I was two doors down from the RA (resident advisor) on my hall, I have to admit, I was a bit disappointed. Don't get me wrong--I was (and still am) a total goody-goody-follow-the-rules-never-get-in-trouble type girl, but living that close to an "authority" figure who seemed like a stickler for rules just put a damper on what I thought my college experience would be like. Little did I know this RA would become someone I didn't want to experience college without. I don't remember exactly how it happened, but one evening I wandered into her open door and an hour later we were still talking (both of us had recently had our hearts broken and ironically the guys we were sharing stories about were both in the Navy). After bonding over our broken hearts and ending the sob session in prayer, our friendship was sealed. We saw one another every morning, spent every afternoon and most evenings hanging out. We colored in coloring books before it was cool, went on Wal-Mart runs together, hung encouraging pictures on each other's doors for exams, and lived for Thursday nights when we watched Survivor, Will and Grace, and ER (in that order). I went home with her some weekends where we rode horses (her passion) and she came to visit me in Georgia. She was a major influence in my Faith--I'd never had a friend that I could pray with, and our friendship was built from day one on God. After two years, our lives took another unexpected twist, and I transferred to UGA and moved back home. 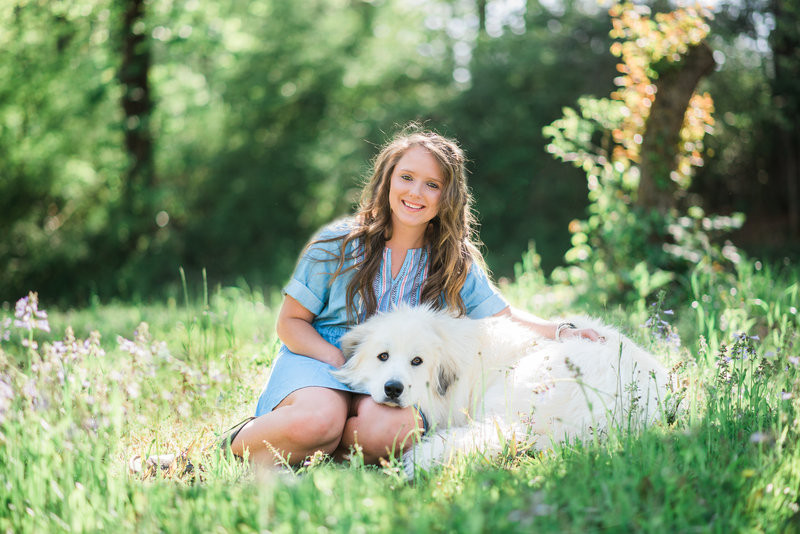 Kristen graduated from Newberry and worked as a Veterinarian Technician in Columbia. I ended up as an English major and took my first teaching job. We both married, our paths wandered away from one another, and the next several years, our rock-solid friendship fractured. One day, after going quite an extended time without any contact, I heard from Kristen. She was moving to Valdosta, Georgia with her then husband, who was in the Air Force. We began a tentative, long-distance friendship, and in our occasional conversations, I learned she was volunteering at a local therapeutic riding center. I was happy she was getting involved with horses again. It was this center that brought us together for the first time in several years. Kristen volunteered for the Equestrian Special Olympics and was going to be close by. I hadn't seen her in years--in fact, I had a daughter and a husband she had never met. Although nervous, I agreed to meet her one evening while she was in town at the stables. When I saw her smile--Kristen's smile lights up her whole face--I knew it was God who was at work bringing the paths of our lives back to an intersection. He knew we would need each other over the course of the next few years--Kristen as she dealt with a divorce, me as I dealt with two daughters who had rare periodic fever syndromes. We re-built our friendship on our Faith and prayer, and we were one another's support through some pretty dark days when our lives were "too much like a pathless wood" as Robert Frost once said. Seventeen years of friendship have passed, and looking back at what we used to talk about, plan, and dream sitting in a small dorm room in Newberry, South Carolina, life is far different than what we anticipated. We have both taken unexpected paths, but along the way we have been blessed, and looking back, it is truly amazing to see how God has been at work behind the scenes. I now find myself blessed to share in a new chapter of Kristen's life--to be able to stand with her and photograph her wedding day. 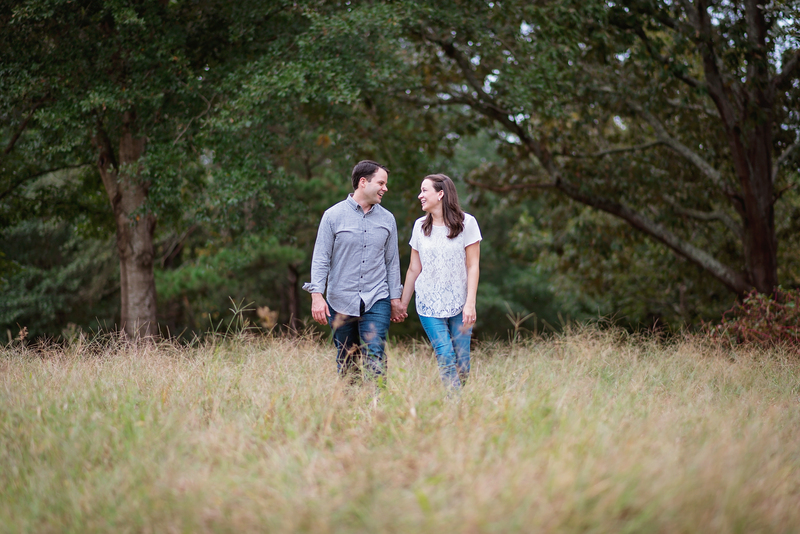 I have enjoyed getting to know her wonderful fiance Shane, and I had a great time shooting their engagement photos. 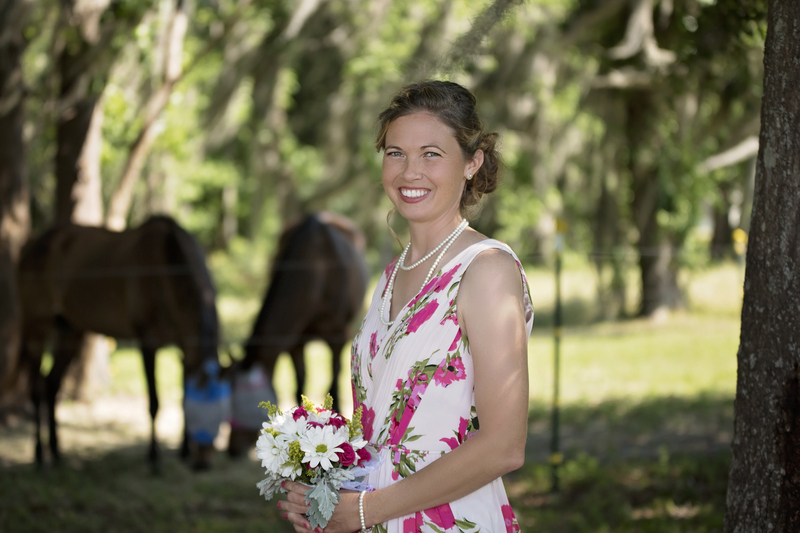 We also got to shoot Kristen's bridal portraits--(she's probably the only woman I know who would be out grooming a horse in her wedding gown and veil before photos!) 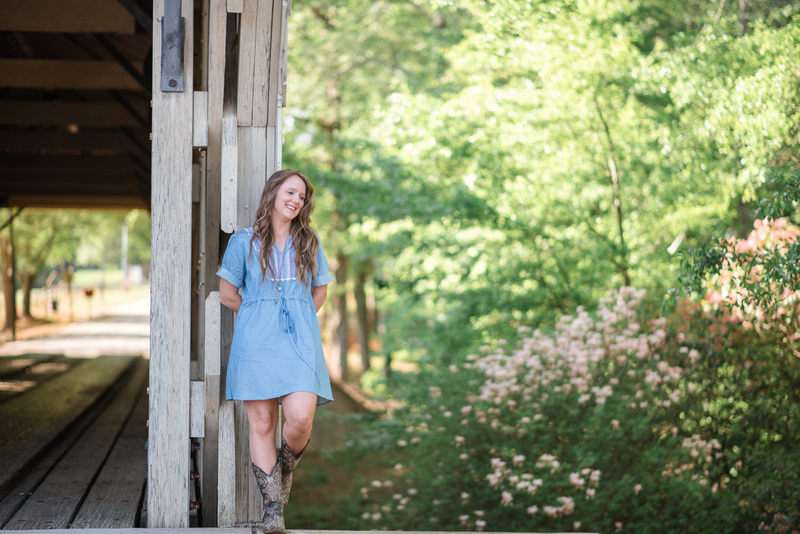 I'm excited to share a few from her engagement session in this blog, but I'll be even more excited after next weekend to be able to share some of her gorgeous bridal portraits and wedding pictures!